Passenger numbers at the Nanaimo Airport have soared to new heights. 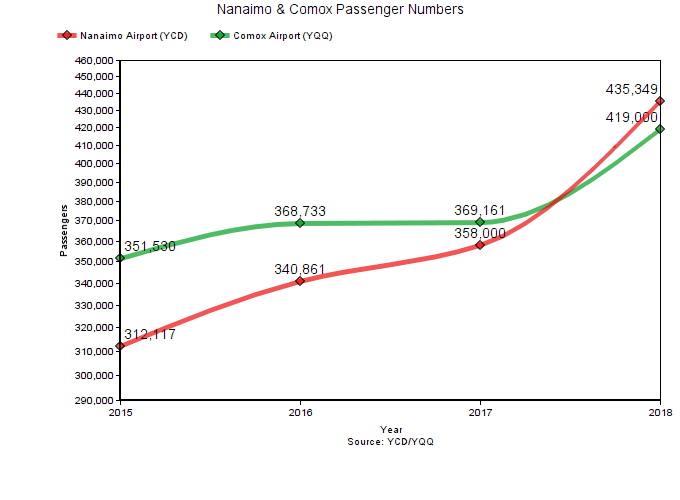 Nanaimo Airport (YCD) handled 435,349 passengers in 2018, surpassing Comox Airport (YQQ) to become Vancouver Island’s second busiest airport based on passenger numbers. YQQ handled just under 420,000 passengers last year, according to Comox airport staff, while Victoria International Airport (YYJ) remains the Island’s busiest airport, handling 2.05 million passengers in 2018. Mike Hooper, YCD’s president and chief executive officer, said it is the first time, to his knowledge, that Nanaimo has exceeded Comox in passenger numbers in single year. Nanaimo’s 2018 passenger figures represent a 22 per cent increase from the previous year and a nearly 40 per cent increase over four years. Hooper said YCD is expecting to handle more than 470,000 passengers this year. “I wouldn’t be surprised if we start to get close to touching 500,000,” he said. One reason for optimism is because Air Canada Rouge will not only operate seasonal non-stop service from Nanaimo to Toronto’s Pearson International Airport again this summer, but the airline has decided to increase frequency on the route, an Air Canada spokesperson confirmed with the News Bulletin. The airline will operate five weekly flights to Toronto between Jun. 21 and Sept. 1. It will then switch to four weekly flights beginning Sept. 2. Seasonal service will end Oct. 7. The route will once again be served using a 136-seat Airbus A319. Hooper said he expected the Toronto route to return this year, explaining it was heavily used last summer. With non-stop flights to Vancouver, Calgary and Toronto, Hooper said the airport isn’t done trying to attract more flights. He said there is strong demand for service to Edmonton – which was cancelled by WestJet in 2016 – Kelowna, Las Vegas and Mexico, but only so much the airport can do to add new routes. YCD doesn’t have the ability to handle wide-body aircraft and with Vancouver International Airport (YVR) nearby, Hooper doesn’t believe large jets are the best fit for Nanaimo. Hooper said YCD is better off serving destinations in North America, the Caribbean, Mexico and Hawaii. In an effort to keep pace with growing demand and attract more flights, YCD recently broke ground on a $15-million expansion project that will increase the terminal’s floor space by 60 per cent when construction is completed in 2020. Hooper said it is all part of a 20-year master plan that encourages the development of a hotel, restaurant and other commercial and aviation related services on airport land. He said there is enough demand for those types of services, adding that he expects a significant development to occur over the next two years.